In our second installment of our Gnomad Homies we were super pumped to Skype with Kaya from @onechicktravels! Kaya hails from Santa Cruz, California. 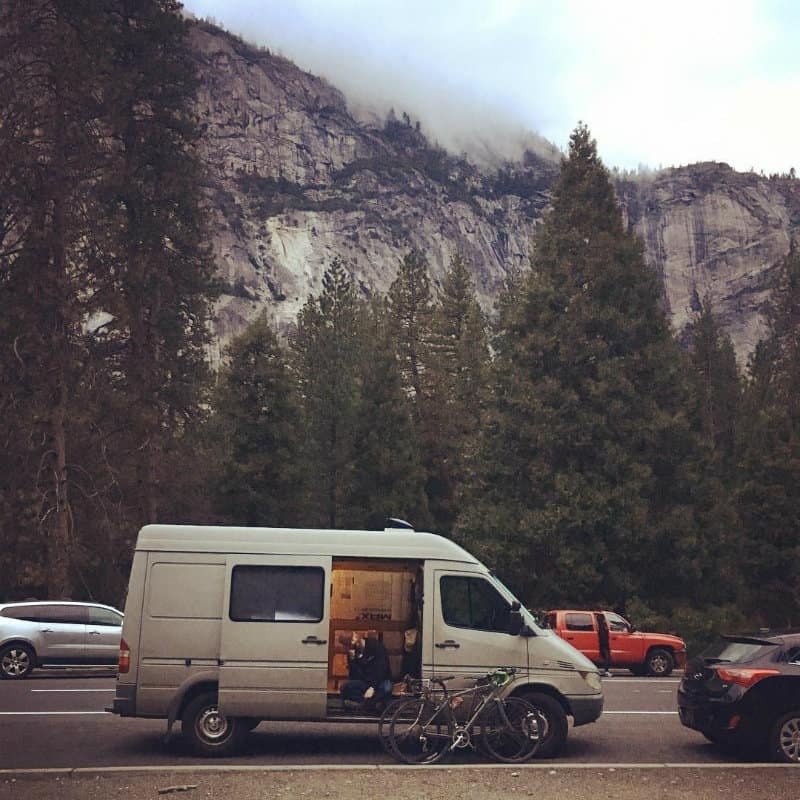 We chatted with her while she was driving to Oregon for the holidays and we got some awesome insight on her custom sprinter van and life on the road. What are you living and traveling in? It’s a sprinter van, and it’s actually the first car I ever bought or owned. How long have you been living in this? And do you live in it full time or part time? 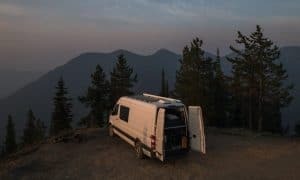 I bought the van in January 2016 and started building it in February 2016. 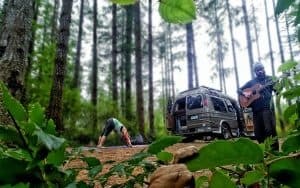 I finished completely and moved into the van on the 28th of June, 2016. My goal is I would like to do this for a year and see where I am next July, and reevaluate if this is something I would still like to do. Maybe, eventually, getting a place in Santa Cruz to rent out so I can go back and forth between living there and being on the road. I don’t remember the exact series of events. It had been a long time coming. I’m both really into rock climbing so I would do a lot of weekender trips. Then I heard about a lot of people who just gave up everything to live by the rocks. I was just kind of like “Oh, that’d be amazing!” but seemed like this farfetched thing. 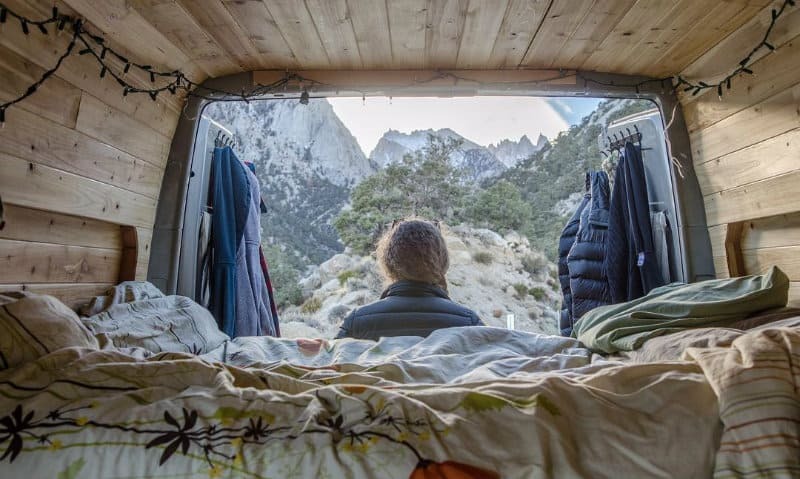 Then my friend’s girlfriend decided to buy a van and live by the rocks and it was just sort of like “Oh my god, I could do that!” So I seriously started thinking about it. 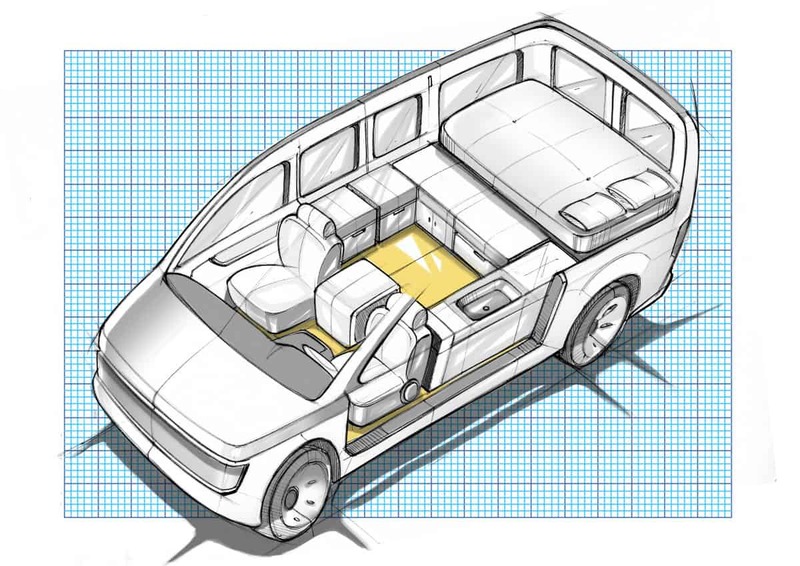 It coincided with my senior year of college and I was able to turn the van build into my final project for my college degree. It all kind of aligned perfectly. Plus, I live in a very expensive area. The rent on average for a house is about $2,500 a month, so for awhile I was staying with my parents. 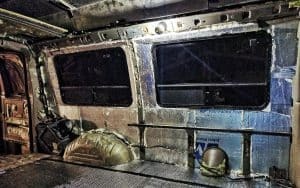 I was living in a room about as big as the van, but also had access to the kitchen and bathroom. So I was definitely used to living in these sort of quarters. The van, to me, seems like a breath of fresh air. I can finally have my own kitchen and my own zone. Before it was 5 people, a dog and 10 chickens all trying to co-habitate. The freedom is obvious. But after that I really like how compact everything is. 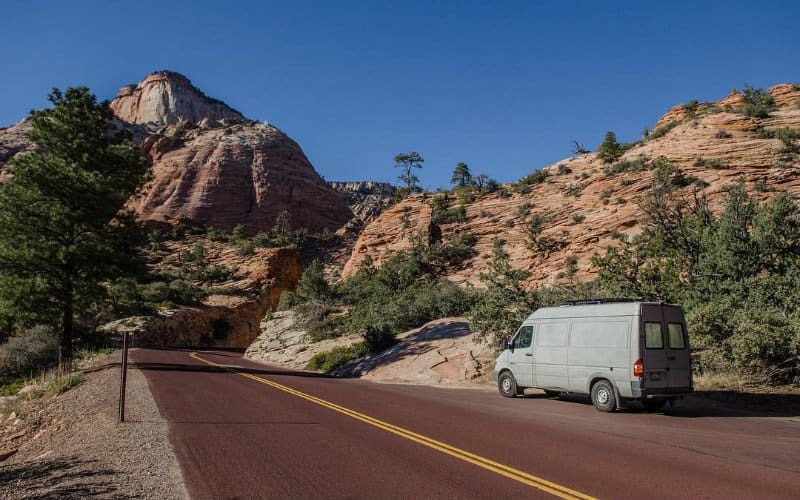 Everything that I own is in this van – minus my motorcycle, motorcycle jacket, and surfboard. I just really appreciate having everything in one spot and not having too many things. I don’t like having a lot of things. My least favorite part is maintaining temperature. I’m trying to figure out a heater solution right now. I’m trying to figure out an outlet situation to have an electric heater at night. It’s been getting really cold. I have two comforters and a wool blanket, so it keeps me pretty warm, but I just hate being cold, so I’m hoping to find a better solution that I can plug-in. This is my first winter. In Santa Cruz it’s pretty mild, the coldest is about 40. I’m heading to Oregon where the weather is 18 degrees and snowing, so this will be my first test. What are your favorite features of your living situation? Anything specifically unique? I have a back up camera! It’s not connected to anything, though. If that worked it would be my favorite. I just got swivel chairs in the van and I really like them because it really opens the space up. I have a pretty large bed, maybe a little wider than it really needs to be, but when I have people over I would normally have 2 or 3 people sitting on the bed and someone standing near the counter, but now the chair I’m sitting in swivels and totally helps to have additional, comfortable seating as well as having the open space. Oh! And solar panels! Those are probably my favorite right now, because I think solar energy is amazing. All of my gadgets are run by my solar energy. My phone is charging, my lights, my food in the fridge – my food is cold, my beer is cold! Also, a friend of mine made this awesome pull up contraption. I wasn’t sure what he was doing. I was working on one thing and then out of nowhere he’s just like – “I need to go do a thing!” and I’m just wondering what he’s doing with this board. But then after awhile he came out of the workshop with this weird contraption and I just told him “That’s never going to work…” But it does! And it’s great! 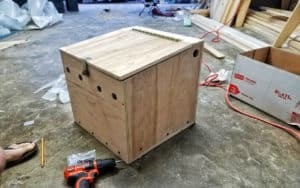 It’s my own little unique, workout…thing! When people come over they’re all like “Hey look! 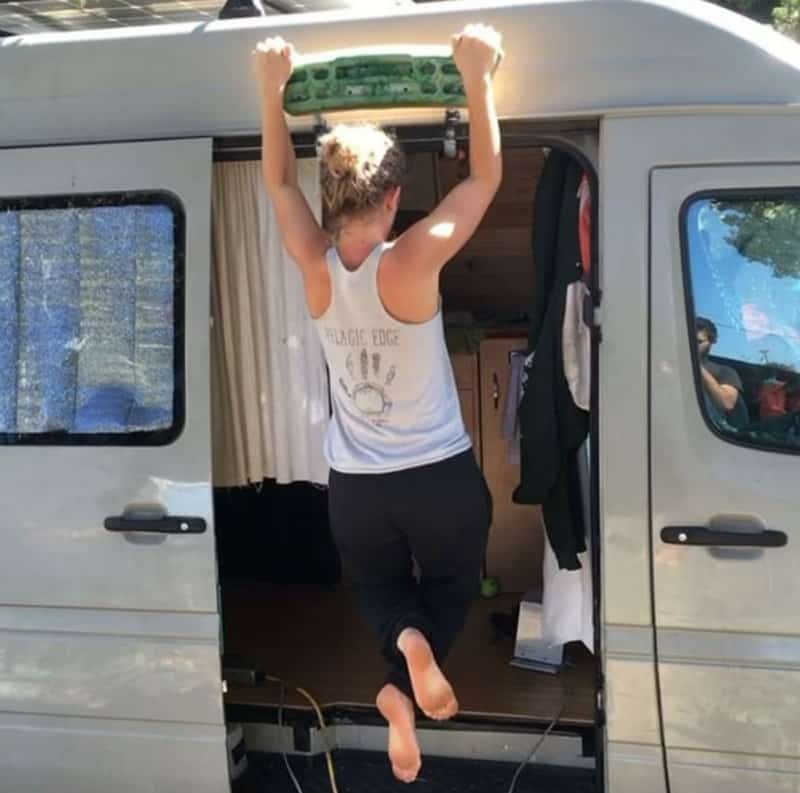 You can do pull ups on your van! I have my own business. I do social media marketing, which allows me to work from the road. I manage people’s Facebook, Twitter and Instagram accounts. I schedule posts, and respond to comments, and I am able to do this all from my phone. I actually just subcontracted somebody to help me out with some day-to-day tasks for the times I don’t have service for 6 days at a time or whatever, she can help take care of any business. I really liked Squamish and the Rocky Mountains area in general. I sort of went up through Vermont, into Canada and back through Detroit, through the US and back into Calgary. The Rocky Mountains from Calgary to Vancouver was an epic, epic drive. I want to go back because it was so beautiful. Squamish in particular was just sort of nestled in the mountains and I liked that because there was a lot of rock climbing there and it was sparsely populated – which is kind of rare in the US. 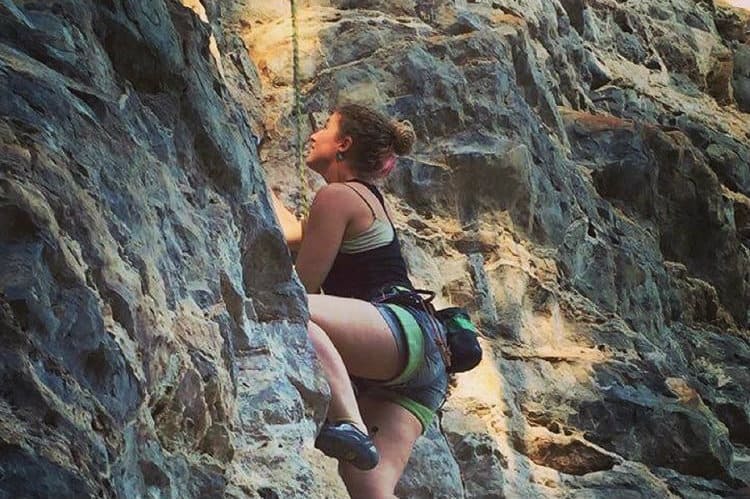 When you go to a national park or something for climbing, there’s people just everywhere. 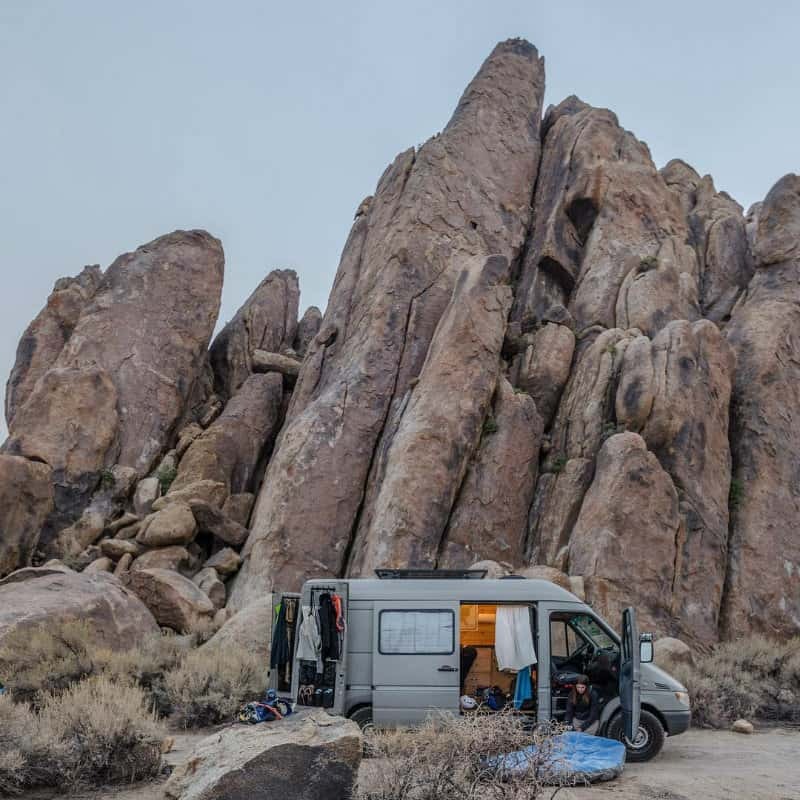 It was exciting to be able to have more privacy with the van and do more rock climbing. This little tiny broom! My mom actually go this for me, right after I moved into the van. I needed a way to keep the van clean and couldn’t use a vacuum. I actually never swept a floor before I moved into the van. I had a vacuum my whole life. Now I use the broom for everything! I brought a laundry hamper that I never used because it was in an inconvenient place. Now I just have a bag that hangs over one of the chairs. I can’t really think of anything else. I really planned out what I was going to need for a long time. I’m sure I threw away a lot of clothes I ended up not needing. I read a book about paring down and got rid of ⅔ of the things I owned, so I was pretty prepared to have only the things I needed. 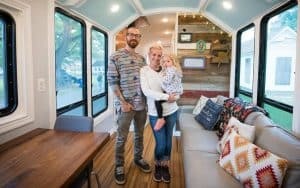 I mean, my life before living in a van was 5 adults living in a very small house sharing one bathroom and most of those adults were my family members so – not really, haha! Like, oh darn! I wish I could go back to having no space and no privacy to now I still have no space but I have some privacy and the freedom of choice. Maybe not being cold and having to find a place to pee in the morning, but I really can’t think of anything off the top of my head. Other than rock climbing — I just got back from a very long trip, and I’ve been more stationary since then. I’ve been parked in my parents driveway because I said I would take some time to work a bunch and save up for some more trips. So, right now I have been working – my social media stuff. I also play music. I’m learning how to play ukulele. There’s no right way to do it. I have put out a lot of “how-to” videos about how I did my build, and a lot of people get mad and tell me, “You shouldn’t have done it like this! This isn’t right!” There is valid criticism for sure, but I think that really stresses people out thinking I’m not doing it right. If you just make sure you attach all loose ends, don’t have any spare parts flapping around and make sure the structural integrity is dependable then after that you can basically do whatever you want with your build. Another good piece of advice would be: It’s going to be okay. I know someone building out a van that is so anxious about each step that he literally won’t do anything. He’s been living in it in a parking lot, but can’t push himself to go. If there’s a leak, fix the leak. If it doesn’t close, sand it down and try again. If it falls apart, start from scratch. 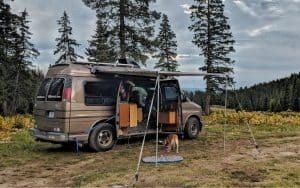 What is your favorite meal to make in your van? OCT: Nicee you like chili mac? GH: We LOVE chili mac! GH: THAT’S EXACTLY WHAT WE USE! OCT: The white shells, the white shells! Be sure to follow Kaya’s adventures on Instagram @onechicktravels. 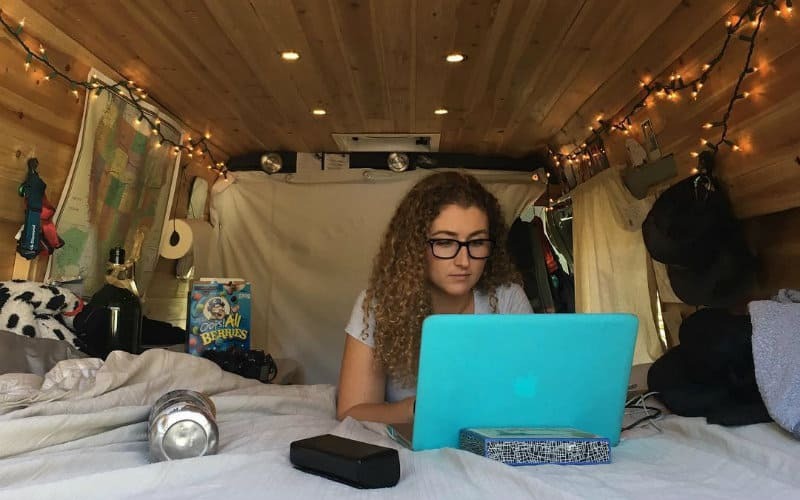 Also, be sure to check out her van life info and build tutorials on her blog and Youtube channel. 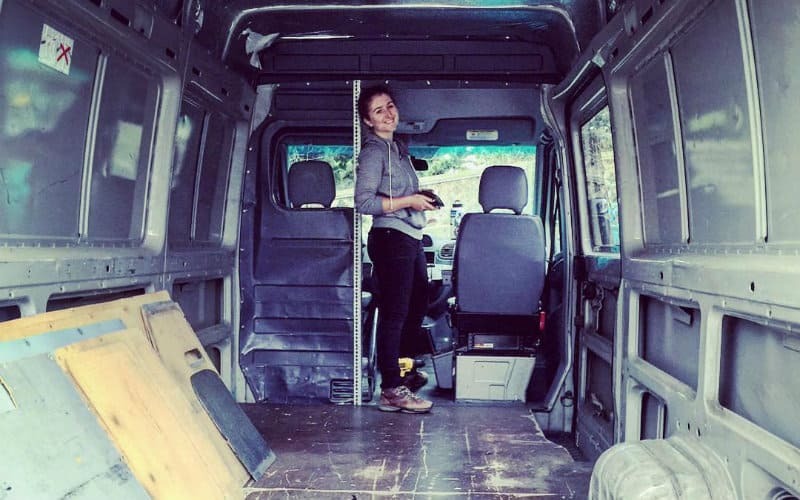 For more Gnomad Homies posts, van build tutorials, and general awesomeness, don’t forget to follow us on Instagram @gnomad_home and on Facebook at Gnomad Home.